Hiking through the forests of Northampton, the Turtles follow Casey’s directions to an abandoned house on the edge of a lake. As Don climbs to the roof for a better view, Leo insists he come down before he hurts himself (Mikey realizing Leo is still spooked from his defeat at the hands of the Foot). Don climbs up anyway, just in time to see a shooting star come careening toward him. The “shooting star” demolishes the old house and lands in the lake. After Don gets his bearings, the Turtles investigate the lake, and are met by a giant robot. Raph jump-kicks the badly damaged machine, breaking it apart and revealing an unconscious woman within. The Turtles take her back to camp so she can recover. Meanwhile, in space, the evil Moriah is infuriated that her ambush on Jhanna did not destroy her as planned. Moriah decides to wait for Jhanna to send a distress signal, then finish her off in person. Back on Earth, Jhanna recovers, and after instantly learning English and recognizing that the Turtles are no threat, she tells her story. Apparently, on her planet of Slandon, after being elected by the people, the new ruler is required to defeat the previous in battle before they can take office. Jhanna was on her way to the agreed upon place of battle when Moriah unlawfully ambushed her. Jhanna sends a distress signal so she can be picked up and begins meditating for her inevitable battle. Moriah intercepts the distress signal and lands in Northampton, bringing along with her a quartet of alien warriors to tip the scales in her favor (a rock-monster, a slug-monster, a teradactyl-man and a multi-eyed, big-mouthed thing). Moriah and her henchmen find the campsite and the battle begins. Jhanna still wishes to win the election honorably, so the Turtles agree to fight only the alien monsters. Leo stabs the multi-eyed, big-mouthed thing in the head, killing it, then proceeds to help Raph with the slug-monster. The slug seems impervious to blades until Raph discovers that it dissolves in water. With Leo’s help, they drive it into the lake. Raph is then plucked-up by the teradactyl-man, but sends him spiraling down to earth, landing on the villain to cushion his own fall. Meanwhile, Mikey is getting clobbered by the rock-monster. The rock-monster hurls a grenade at Don, who bats it back at him like a baseball. The grenade lands in the monster’s mouth and explodes, killing him. With the field evened, Jhanna tells the Turtles to stand down while she takes on Moriah. Moriah begins to take the upper hand in battle, but Jhanna knows that it is her duty to free Slandon from the tyrannical rule of Moriah’s family. Jhanna wins the battle, but rather than kill Moriah, she opts to brand her flawless face with a symbol of her defeat. Jhanna then beams her victory back to Slandon and she and the Turtles ditch Moriah to wallow in defeat. Don watches over Jhanna as she rests from her battle before falling asleep himself. In the early hours of the morning, Jhanna receives the transport signal. She cuts off her warrior’s braid and lays it over the sleeping Donatello before disappearing. In the morning, Casey and April arrive in their car to pick the Turtles up. Naturally, they don’t believe a word of their story. Don, however, is speechless as he looks wistfully into the sky, clutching the braid in his hand. *This story is continued from TMNT (Vol. 1) #12. Chronologically, the story continues in TMNT (Vol. 1) #14. *Leo was “trashed by the Shredder’s goons”, as Mike puts it, in Leonardo (microseries) #1. *This issue also featured a full-page pin-up advertisement for Tales of the TMNT (Vol. 1) #5 by Kevin Eastman and Ryan Brown and a pin-up of Leonardo and Gizmo Sprocket by Michael Dooney and Peter Laird. *This episode was adapted for the 4Kids TMNT cartoon as the season 4 episode, "The People's Choice". 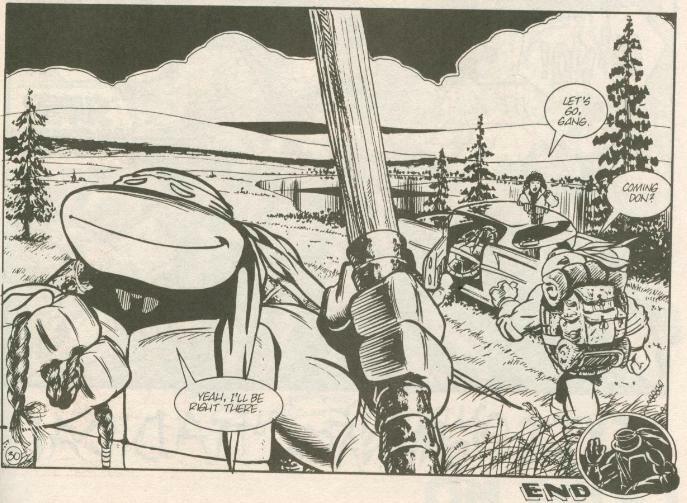 The “Exile to Northampton” story arc consists primarily of one-shot stories that rely on the Turtles being in the right place at the right time for something weird to happen. Factoring in the Tales of the TMNT (Vol. 1) issues that take place in this timeframe, a few of the stories introduce recurring characters and villains… but most of them don’t. “The People’s Choice” is a story that doesn’t really offer anything lasting other than the knowledge that Michael Dooney is a kickass artist. 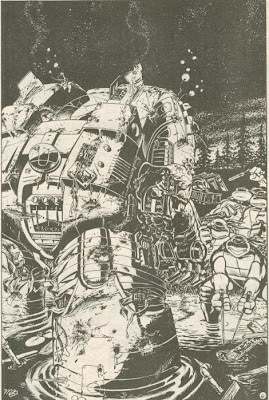 Considering all the subsequent outer space adventures the Turtles would go through, particularly during the Volume 4 era, you’d think that Jhanna might have made a comeback or something; the fact that they helped save a planet from another term of corruption and tyranny might actually be an important footnote in intergalactic politics. But like a lot of Mirage stories, it’s simply a one-shot with no impact whatsoever. The Turtles help Jhanna win her election and never see her again. Don is visibly smitten with her, possibly his first crush (that we know of), and nothing ever comes of it. “The People’s Choice” is an interesting story but it offers nothing in the grand scheme of things. But taken as it is, as an isolated tale, it’s definitely “neat”. The electoral system of Slandon is certainly wacky, but a nice compromise between the terrestrial democracy we recognize and the stereotypical “barbaric alien ruling class” stuff we get so often in science fiction. There’s an election, sure… but you still gotta kill the other guy. This is Michael Dooney’s first issue since TMNT (Vol. 1) #9 and you can really see his style evolve. While his Turtles aren’t quite at the model we recognize (they’re more beak than cranium, given really weird skull proportions), they’re practically there and Dooney’s sense of action staging and humor is top notch. He adds a lot of cartoony effects, like Xs in the eyes or swirls above the Turtles’ heads when they get knocked out and it strikes a nice balance between action and comedy. Dooney is a very talented painter and he brings that skill to his inking (I’m pretty sure I’ve made this comment somewhere before in my reviews) and his inks are a gorgeous complement to his pencils. There’s so much depth and dimension to the characters, particularly the heavy shadows, that really make the pages pop. And man, does he do metallic surfaces like a champ. “The People’s Choice” is an issue with an okay story (you’ll learn to live with the “right place/right time” plot devices in Mirage’s TMNT comics because they do it all the time), superb art but no real necessity to any continuous narrative. So, in that last regard, I suppose it could probably qualify as “skippable”, but you really should check it out, anyway. "There’s an election, sure… but you still gotta kill the other guy." Man... I wanna see more of this in my sci-fi movies. Any thoughts on the animated 4Kids adaptation of this story? It's been a long time since I watched that episode. 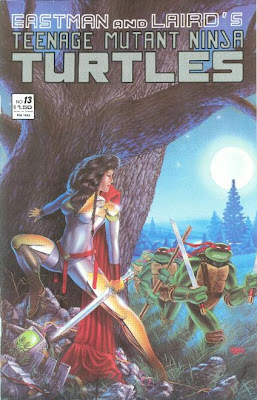 Do you know why this issue was not included in IDW's "teenage mutant ninja turtles: the ultimate collection volume 3"? The reasoning, I believe, is because this issue was 100% Michael Dooney and the Ultimate Collections were designed to focus on the works of Eastman and Laird.